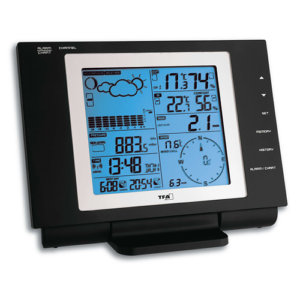 Sophisticated products such as the Nexus and Sinus stations or weather stations are described in detail in the following FAQ section. Please click the corresponding button. How can I order from you/TFA? Where and how can TFA products be purchased? As manufacturer we only supply the specialist trade. As end consumer you can buy our products at numerous opticians, DIY stores and electronics specialty retailers. Or you can place your order directly at one of our shipping partners for end costumers. Unfortunately, the values of the outdoor transmitters on my radio thermometer/ weather station are not shown. What do I have to do? Place the instruments next to each other in front of you on the table (approximately ½ metre distance) and remove the batteries from both instruments. Thereby please ensure that only proper 1,5 V. batteries are inserted (no accumulators or weak batteries), replacing old ones if necessary. Please check the instruction manual (which can also be downloaded in the service area) for the correct order that the batteries need to be inserted (e.g. first inserting the base station and then the sender or first the sender and then the base station). Then insert the batteries into the first instrument. Wait several seconds before inserting the batteries into the second instrument. Please do not press any button during or directly after the first set-up since the data search process of many weather stations is interrupted this way. We recommend that the instruments are being operated next to each other for some time in order to observe whether the instruments work properly and consistently. Afterwards, the instruments can be placed as wished. Outdoor transmitters with own displays that do not the report the correct weather information after the insertion of the batteries are likely to be defect. Repeatedly failing, the outdoor transmitter of my instrument is not indicated. As recommended, a reset was performed and the batteries were double-checked. However, the instrument has worked properly in the same place before ?! In this case it must be investigated whether the instrument has en error or the radio signal is interrupted locally. In both cases, the problem might develop over time. In order to exclude local radio interference, we recommend that the instruments are reset and then observed lying next to each other. In addition, it is advisable to use the instruments at a distant place (e.g. at the workplace, relatives’ or friends’ home) in order to investigate whether the instruments function properly there. If the instruments only malfunction at the targeted location, but work next to each other or function at a different location, a local radio interference is the origin of trouble. In this case, either the base station or the transmitter has to be moved. In case the devices do not function properly even next to each other or at different locations, an error is the likely cause. Instead of indicating the measuring value, the display of my station shows “OF.I”, what can I do? In this case a complete reset should be performed. If “OF.I” is still shown afterwards, a defect is the likely cause. This error message is presented if the corresponding transmitter cannot determine a plausible measuring value (e.g. outside the measuring scale / malfunction of the sensor / defect). My new measuring instrument with dressing recommendations (Wetter-Boy, Weather-Kitty, Meteo-Max usw.) does not work. The display of the weather figure shows all information segments at once?! or my Weather-Kitty/Wetter-Boy has three arms and wears all clothes at the same time?! It can be observed that the dressing recommendation is mainly based on the outside temperature, which is received on the base station in channel 1. Hence for a correct display of the dressing recommendations, it is necessary to set the transmitter measuring the outside temperature on channel 1. If no temperature or an interior temperature is received on channel 1, this results in a wrong dressing recommendation. On my radio weather station the air-pressure gradient is continuously changing, is that normal? Yes, the continuous change of the air-pressure gradient is completely normal, being the standard setting for almost all of our radio weather stations with air-pressure gradient on display. This function cannot be deactivated. My radio weather station with a single weather symbol never actually shows the correct symbol for the current weather. When sunny, rain is indicated etc. What’s wrong here? These weather stations possess a prediction function, which really has to be understood symbolically. Therefore a rain cloud does not necessarily indicate rainfall. The same symbol is also shown if the air-pressure decreases/ has been decreasing over a certain period of time, thereby enhancing the likelihood for a worsening of the weather conditions in the next 12-24 hours. There is a large difference in measuring value between my TFA-measuring instrument and another device. Which one should I trust and can I readjust something? Place the two devices (a third measuring instrument is advisable for comparison reasons) next to each other horizontally and wait for several minutes for acclimatising. Please keep in mind that the measuring instruments might have different tolerance levels. With respect to TFA products, the tolerance level can usually be retrieved from the instruction manual or can be found on the packaging. When comparing two devices with a +-1°C tolerance in both directions, the worst case could be that the measuring values differ in 2°C from each other. Hence it is recommendable to use a third measuring tool for calibration reasons. If the tolerance level of your TFA-device is exceeded, we ask you to please make use of the warranty. In general, analogue devices cannot be simply readjusted. The same holds for electronic measuring instruments, where recalibration is not possible if not indicated differently in the instruction manual. 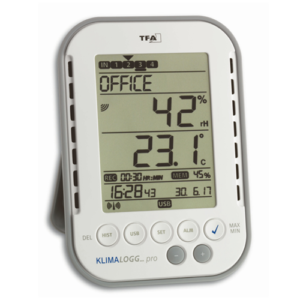 I own an analogue hygrometer, which has been in use for a long time, no I bought a new hygrometer. The two devices show very different values. Which one is correct? Analogue hygrometers have to be “regenerated” in regular intervals in order to ensure precise measurements. This procedure includes wrapping the hygrometer in a wet piece of cloth (e.g. every 6 months for 15 minutes). Usually, a humidity of approximately 95-99% rH is achieved under these conditions. If this is not the case, the hygrometer-to-be-adjusted should be placed next to a reference hygrometer after regenerating. Allowing for acclimatisation time, compare the two devices and readjust if necessary (a wet piece of cloth is not necessarily a suitable point of reference). 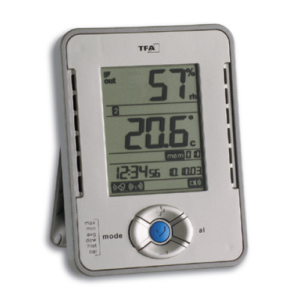 Electronic hygrometers are not affected by the need for regenerating and thus cannot be readjusted. Why do I have to manually set the relative air-pressure on an instrument after initial set-up and where can I find the current reference value for this? On a barometer the current reference value must be readjusted after a change in location or after initial set-up so that the instrument takes the current altitude and weather conditions into account. The current reference value can be found in the internet, at public institutions or from your local weather service.